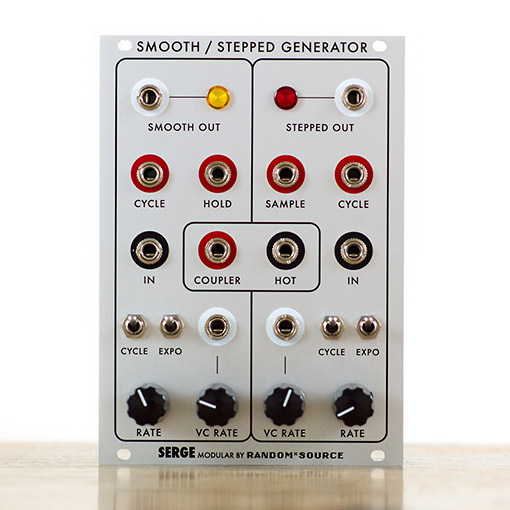 The Serge Smooth & Stepped Generator (SSG) is a complex multi-functional module which can be patch programmed to provide various slew and sample functions both for audio and CV signals. It is one of the essential Serge modules. The Smooth section will place a positive and negative slew on input voltage transitions for lag effects, voltage controlled portamento and for low frequency filter applications.” In Cycle-mode (cycle jack patched to the input), the Smooth side “will oscillate yielding a voltage controlled triangle wave LFO. A high level into the HOLD input will enable the Smooth Function to be used as a track-and-hold circuit with voltage controlled slew rate. The Stepped function can be used as a sample-and-hold with voltage controlled slew rate limiting. In Cycle mode, a pulse applied to the Sample input will generate complex staircase waveforms for control voltage applications and for use as audio signals. The Coupler is an internal comparator which compares the output levels of the Smooth and the Stepped Generators. This output is useful for generating complex control voltages or random voltages. The Random*Source version of the Smooth & Stepped Generator for Euro is a licensed and authorized adaption of the original Serge design that provides an increased audio range of the Smooth Generator and a bipolar (“hot”) Coupler output in addition to the regular (unipolar) Coupler output. 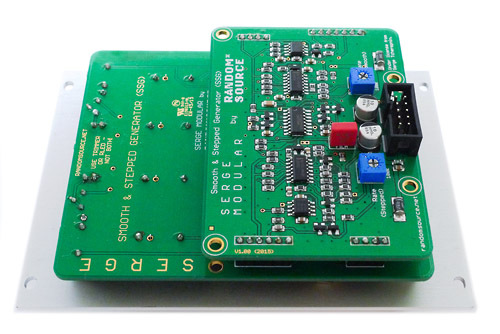 Now - for the first time ever and licenced by Serge - the SSG is available as DIY (SMT) kit for Euro.